MACACCINO is an amazing refreshing drink, healthy alternative for coffee, rich in chocolate and maca. Macaccino is made of 10% maca, 70% powdered cacao, and 20% coconut palm sugar. 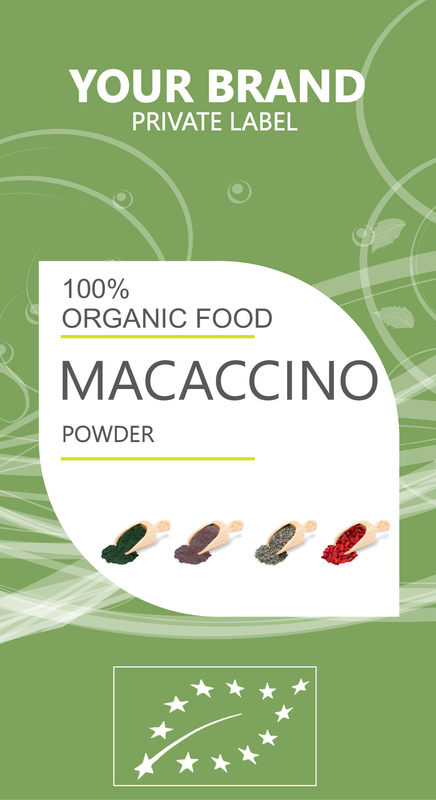 Macaccino is a superfood mix, tasty coffee substitute, caffeine free! It is an amazing combination of three powerful antioxidants: raw organic cacao, organic maca and organic coconut palm sugar. It’s a healthy alternative to caffeine drinks – tea of coffee. Is has everything- vitamins, minerals, fibers, enzymes and amino acids. It is a great source of minerals such as magnesium, iron, copper, sodium, potassium, calcium, phosphorus, manganese. It contains Vitamin C, Vitamin A, Vitamin D3 and vitamin B1, B2, B12. MACACCINO is a mix of maca, cacao and coconut palm sugar. Every single one of them has its own benefits. Noc, can you imagine what happens if you put them all together? Lets see what are the benefits each one of them. MACA is full of vitamins, minerals, enzymes, 20 amino acids, of which 7 are essential amino acids. It influences fertility, sexuality, digestion, brain physiology and energy levels of nerves. It regulates hormones, influencing sexual function, increasing sexual drive, shorten recovery time after sport activities, increase emotional and psychological wellbeing. It is also an adaptogen, since it increases cellular sensitivity to stress. An adaptogen is a botanical that greatly improves your body’s ability to adapt to stress, whether it’s a hectic schedule, heat or cold, noise, high altitudes or any number of other stressors. This elite class of herbs impart strength, energy, stamina, endurance, and improve mental clarity. COCOA is superfood full of antioxidants, magnesium, iron that fill us with energy and make us feel good and healthy. The last, but still the same important is COCONUT SUGAR, which is made from coconut palm tree flowers, has crystal structure, is rich in minerals, and low in GI. It has same form, taste, and melts almost exactly the way as white sugar. The difference is this product is 100% natural and non-refined. Nectar of palm tree flowers is collected and dried on the sun and air, and cristalized naturally, turning to crystal brown sugar. This sugar is rich in vitamins, minerals, phytonutrients, including Calcium, Zink, Iron and vitamins B1, B2, B3 and B6.